Beauty salons pride themselves in their ability to make anyone who goes through their door at least 50% better-looking. It’s the beauty industry’s main ethos. They promise to give their customers a massive self-confidence boost by giving them the haircut, hairstyle, or hair color that they need to emphasize all those lovely facial features. They also offer a wide range of services that vary from meditation, to mud baths, to nail care, and even face and skin-centered facilities. Bottom line is that the industry’s main source of income is their power to beautify, and this should be apparent in everything that customers may directly connect to them such as their physical store’s look, their shipshape employees, and even their virtual correspondence with their customers. You may also see corporate email signature examples. Branding is an important tool which, when appropriately used, can give your business a major edge in the present day market’s serious competition. It can give you the advantage of gaining an impression upon the general crowd. However, the tricky thing about it is that it can both be done consciously and unconsciously. Even the simplest actions associated to you can brand your business’s name, either positively or negatively. You may also like business email signature examples. For example, a customer enters your store and finds the whole place in complete disarray, the machines dirty, the floor uncleaned, and the staff doing things they are not being paid to do like loitering around being useless. Irregardless of how hard you try to create a good image for your business, this is the snapshot that they will get of you: a beauty parlor with an ironically unappealing store and staff. This incongruity will not work any wonders for you. You may also check out how to create your email signature. The same rule goes for your correspondences. Not only should you try to be as responsive to your clients’ inquiries and complaints, you must also try to make each one memorable by trying to reflect as much of your business’s values into it. A simple, commonplace email can be more than just a medium for communication. In fact, it’s a loud screaming marketing opportunity that you can use to sell your business and to market your brand. As ordinary as emails are, they can actually be used to entice customers into trying out your services, while also effectively projecting the image that you want the public to see you as. You might be interested in the dos and don’ts of a good email signature. You can do this by incorporating the perfect email signature to end your email with a flourish. It’s the 21st century. Boring and dull is so last era. It’s about time that we all learn an email signature’s ability to personalize every correspondence, and to make sure that our goodbyes reverberate in our recipients’ minds so that they can never forget it. 1. A professional email signature can properly portray your personality. And when you are in the business industry, this can be a powerful advantage. Prospective clients can already create an impression of you even before they’ve seen your store and tried your services. With an attractive email signature, you are nonverbally marketing your brand to your audience. 2. An email signature can make your sign-off more interesting. Goodbye, respectfully yours, and best regards are some of the email closing phrases that are so outdated they should be thrown into the year they were invented, then burned. There is nothing more characterless than using sign-offs that, in no way, reflect who you are as a business. You may also see how to make a professional email signature. Using email signatures can change all of that (and do so much more). It can help you leave a mark on your clients’ mind so that the next time they’ll see or hear your brand, they can easily identify you since you imaginatively ended your correspondence. 3. An email signature will make you look more professional. As they say, email signatures act like virtual business cards. Having one incorporated at the bottom of your emails will give the impression that you are serious about what you are doing, and that you are intent on rising up to your competitors. It also sends out the message that you are taking your craft seriously (in fact, you’ve painstakingly created an email signature to show for it) and that they should too. You may also like music email signature designs & examples. 4. A simple email signature is really just a sly way of making sure that your recipient always has your information within their reach. By being effortlessly reachable, you are keeping your prospective clients from running toward your rivals for an appointment, because why would they (ever again) feel the need to when they have your website, blog, and private newsletters; your Facebook, Twitter, and Instagram accounts; plus two of your active phone numbers right there on their screens? An email signature is a cunningly creative way of serving every possible medium of communication on your clients’ phones. 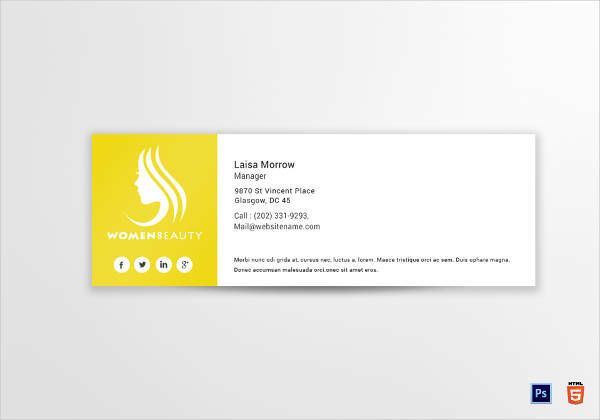 Why would they try Googling for other beauty parlor’s contact information when they have yours in elegant fonts? 5. An email signature can help you invite more social media followers for free! Since you’ll probably add a hyperlink of your social media accounts on your email signature, your email’s recipients can easily click these icons to take them to your sites. Really, it’s all about the hassle-free. Customers nowadays will bite into anything as long as it won’t take more than 5 seconds of their time. 6. An email signature will serve as your informal introduction. Email signatures often include either a picture of you (the owner and the artiste) or your business’s logo. Whichever graphic element it will contain, your email signature will instantly enable your recipients to recognize your brand when they see it. You may also check out sales email signature designs & examples. 7. An email signature can serve as your platform for promotion. 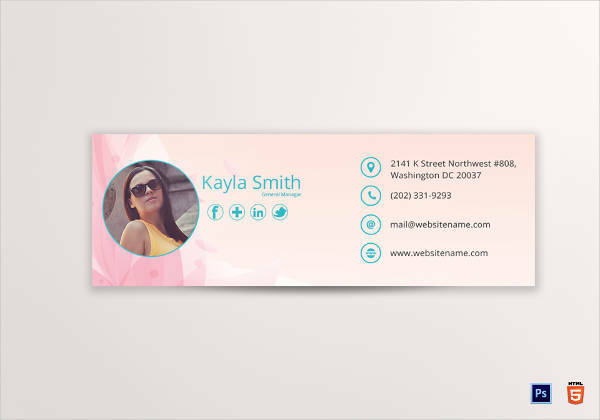 Instead of posting promotional banners such as an upcoming sale, or any event you may have organized in places where your recipient may or may not see it, why not send him a personal invitation using an artistically designed email signature, intentionally attached at the end of your email correspondence? You might be interested in human resource email signature designs & examples. It can also serve as an assurance that your promotions and announcements actually have an audience since an email signature is pretty hard to miss. 8. An email signature can show your position in the company. For example, you, the beauty parlor’s owner, have taken it upon yourself to respond to the messages sent to your establishment. Including your position on your formal email signature is a lot like demanding the respect that your title owes you. (Unfortunately, some positions would merit more respect from people than others.) It’s a humble way of announcing to your audience that the very person who is taking the time to respond to their inquiries is the owner himself. Your email’s recipient will appreciate the authoritative figure with whom they are talking to. Email signatures, as with every marketing strategy (since that’s what this is), may work better for some than for others. The results you may gain from it may be different from the fruits that others have reaped. Although the list provided above is comprehensive enough, it may not sufficiently itemize the usefulness of email signatures for you and your business. Perhaps it can offer more products than you know what to do with. You might think that making and designing your own email signature is something you can easily manage. Although it isn’t a particularly difficult task, there are still some things you’d do best to take note of to guide you (especially if this is your first time) in creating one. You may also see professional email writing tips and examples. After all, our aim here is not to simply have an email signature, but to produce one that will help us do so many things at once: market our brand, communicate our business’s contact information, and end the email with a twist. 1. Find a good layout. A good professional email signature is both informative and neat. It should hold enough information to truly give your recipient an idea on who you are without being too overwhelming and crowded. It should be straight to the point, but in a way that no important detail is left out. There should be a strict balance between these elements, and finding the layout that will work best for you can make this task easier. 2. Include social media links. A major approach to making sure that your business’s voice is being clearly heard among all the noise that your rivals are making is to make sure that your customers can find you in every popular social media platform available. This is not you being desperate, this is you being a business in the 21st century world. By being present where most of the masses are, you are leveling yourself with everybody else, and that is a great way to establish a common ground with the public. 3. Include your websites and podcasts. Another effort at trying to not appear shady is giving your audience the chance to explore the variety of platforms where they can find you and keep updated on new information about your business. 4. Limit yourself to at least one or two fonts. Using different font palettes for your email signature will make it look like an elementary student’s art project. If you really want to impress your audience, use fonts that are both attractive and readable. It should be pleasing to the eye while being comprehensive. You may also like hotel travel email signature examples. Don’t forget that one of your main goals is to market your brand, and you can’t do this if your audience can’t understand whatever you’re blabbering about because your fonts are more distracting than helpful. 1. Don’t clutter your email signature with too much information. For example, including your personal home address into it will not help you achieve your marketing goal, nor does it interest your audience. Emphasize instead your business’s physical location since that is what we are trying to project here. 2. Don’t use multiple fonts and colors. Minimalism has recently killed elaborate styles and complicated curlicues, so if you want your formal email signature to make a trendy statement, for once, go with the flow (and, please, let this be the only time you follow the mainstream). Go for a classy and elegant look for your email signature. This is so much more pleasing to the eye, and what we want is for our audience to be completely hooked to it. 3. Don’t include unnecessary personal quotes. Using quotes and other inspirational or amusing statements on your general email signature is completely okay as long as the message is directly related to your business. Otherwise, you’ll just sound tacky and fake talking about world peace and kindness when you’re in the beauty industry. Save that for a Facebook status or an Instagram caption. To create a solid impression upon your audience, only include information that will put your business under the best light. Not you and your personal values. 4. Don’t use too many images and social media buttons. Having too much social media buttons on your email signature may only make it look faulty and, yes, bordering on desperate. The same rule goes for images. Limit yourself to at least two images. Your email signature is not a visual art contest. Its main target is not to illustrate your graphic design ability. Every smallest element on your email signature must work toward promoting your business. Each detail must be relevant to that professional goal. The business industry is a shark-infested water. Staying afloat will require you to use all tools available to you. You need to be equally cunning and resourceful. Otherwise, you won’t stand a chance against these predators. Utilizing an simple email signature for your everyday correspondence is an effortless tool in making sure that your business is not only noticed, it will also be remembered.